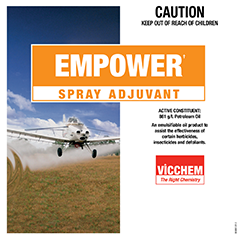 Empower Spray Adjuvant is a petroleum based spray adjuvant that is designed for use with agricultural products in non-cropping situations. Increases spreading and penetration of the active ingredients into the target. Empower’s balanced formulation of oil and surfactants enables it to mix readily with most types of products and water used for agricultural spraying. 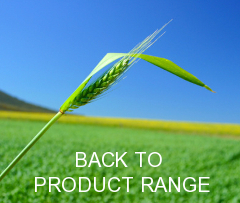 Empower has been used successfully for many years by farmers to improve the performance of their agricultural spraying programmes. The two major uses are as follows. 1.Empower is designed to assist the performance of knockdown /non-selective herbicides in non-crop situations by acting as an anti-evaporant and by increasing the penetration of the actives through waxy leaf cuticles. 2.When a crop has reached maturity and phytotoxicity is no longer a threat to its yield potential (eg.Cotton Defoliation),Empower can be a useful adjuvant for improving the performance ofcertain agricultural products (eg.defoilants,insecticides etc. ).Under these circumstances Empower has proven itself as aneffective and economical bulking oil for ULV sprays. Always strictly follow the directions for use as specified product labels. Manufactured according to the International Standard ISO 9002 ensuring quality,consistency and reliability.